BMW G310GS - Everyday Adventures. BMW Motorrad G310GS could change the way people used to see the entry level adventure motorcycle segment. 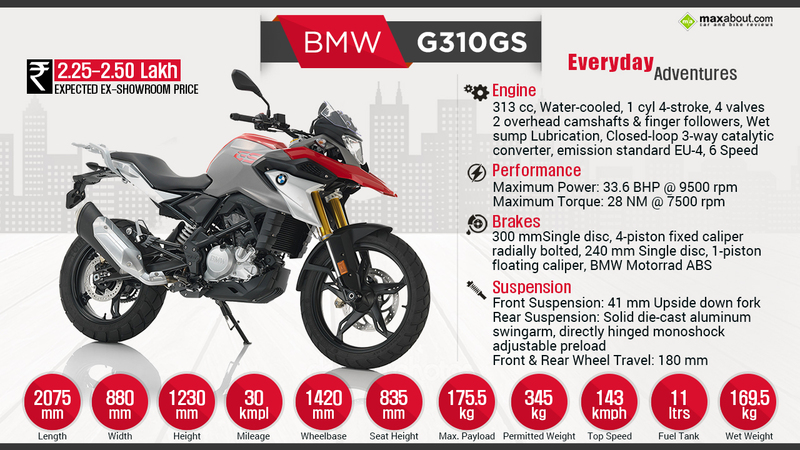 BMW G310GS is based on the street naked G310R and uses the 313cc, 1-cylinder liquid cooled and fuel injected engine producing 33.6 BHP and 28 Nm of torque. The motorcycle has been developed in Germany while its manufacturing responsibility is in the hands of TVS Motors, currently producing the bike at its Chennai plant. The off-road friendly features of the G310R includes long travel suspension, baggage mounting provisions, dual purpose tyres and extended front frame for aerodynamic efficiency. The motorcycle will make its official entry in the Indian market in late 2017 while its naked cousin G310R will be launched in March 2017. They have the potential to change the company’s fortune and fetch more sales for the BMW brand than ever before in the emerging markets. Click here to know more about BMW G310GS.